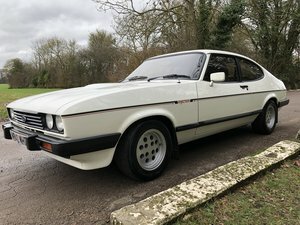 Here we have for sale a very nice, Ford Capri 2.8 Injection, with just two previous owners, and the last owner having loved this car for over 12 years. 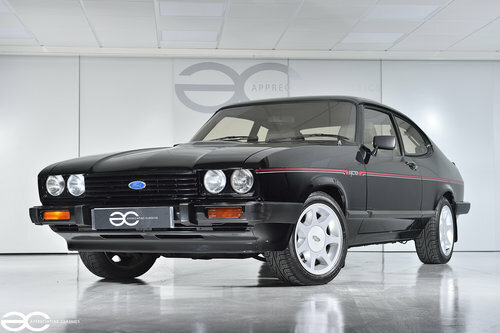 With this Capri 2.8i comes a nice history file, which includes the likes of, the original purchase invoice, original booklets, original V5, original booklet retaining wallet, and the spare key. 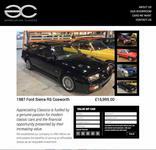 Original purchase invoice states that Mr D.E.Thompson was the original owner, paying £9,819.81 minus his trade in of a Renault 18 TS. Mr Thompson owned the car until May 1997, when Mr A.M.Beasley purchased the car. In February 2005, the car was purchased by Mr A.Scott. With long term owners, this car has been loved. 29 old MOT certificates are present within the history file to fully warrant the mileage. 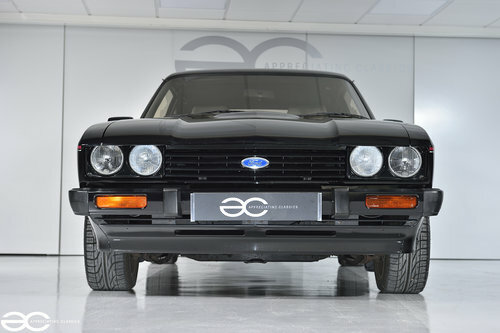 Service history is present for the earlier years of the cars life, unfortunately some later service history has been lost, however, we have had the car serviced ready for the new owner. 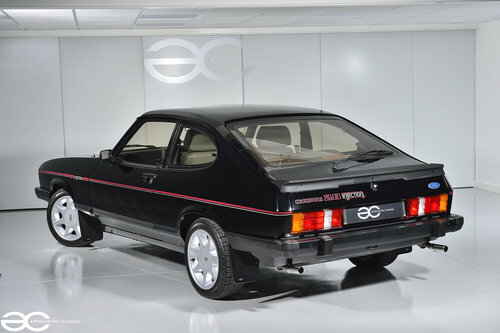 The bodywork shows clear signs of long term dry storage throughout its life, with no corrosion issues. 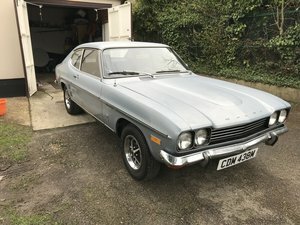 With the last owner having had the car for over 12 years, and having kept the car garaged with only dry usage, it is obvious this example has been cherished. Maintaining the majority of its original paint, this car still looks great today. Original pinstripes appear to be in place throughout, and as mentioned, no corrosion issues are present. 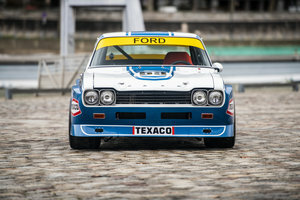 The car has a few small age related marks,including a small ‘burn mark’ to the drivers front wing from over polishing in the past (only visible in particular lighting), the age related marks are very minor and overall it presents really well, and would be right at home at any local classic car show. The badges and lights all appear to be original and again, present well. Side & Rear window glass is original, with etching of the registration present & rear opening windows, operate and seal correctly. 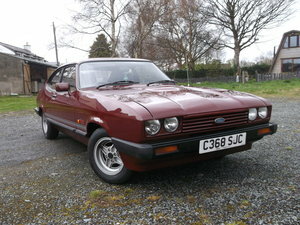 A very nice Capri 2.8i in a great colour. As you can see from the pictures, the interior does present well. 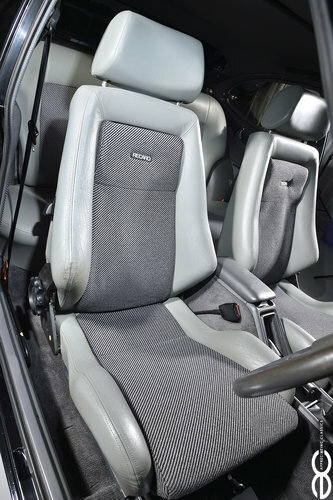 Rear seats are in superb condition, and the front represent the mileage correctly. The drivers bolster and steering wheel are showing signs of wear as you would fully expect at 56k miles, however, overall the interior presents well. Everything works as it should do, including the heater on all speeds and the rear wiper. 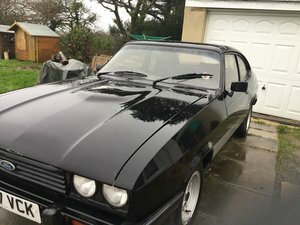 The only none original item inside the vehicle is the stereo, however an original dash surround is with the car, should the new owner wish to source and fit an original stereo. 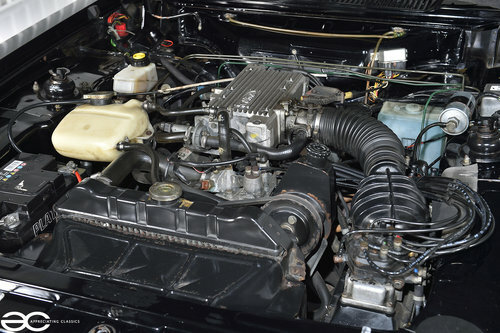 The car starts and runs superb, even with a cold start, the car starts quickly and with no unwanted noises or smoking. On the road the car drives very well, with adequate power and smooth power delivery through the rev range – whilst making a glorious noise of course. The engine bay itself present well, representing its mileage just as you would expect. 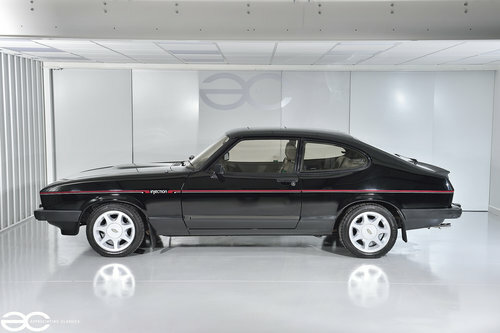 As you can see from the pictures, this Capri is sporting the 7 spoke Capri 280 ‘Brooklands’ wheels, which are all in good order and help make this car look fantastic. Regarding the rest of the running gear, the car drives very well, nice and straight, with brakes, steering and suspension all operating exactly as they should do. The clutch is a pleasure to use, and the gearchange is nice without any issue.